After receiving a presentation from the Ketchum Parks and Recreation Department regarding the progress of a proposed river park north of town, the Ketchum Planning and Zoning Commission directed department staff to write a letter to the city’s residents in support of the project. The park would run through about 1,500 feet of the Big Wood River on BLM land immediately southeast of Hulen Meadows subdivision. The city still needs to secure ownership of the federally owned land before it can build the $2.7 million park. Parks and Recreation Department Director Jennifer Smith said the city is in the process of applying for a Recreation and Public Purposes Patent from the BLM that would transfer ownership of the land to the city. 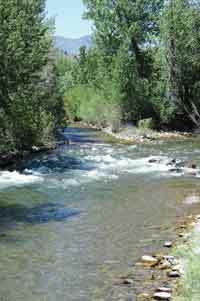 She said that under the patent, the BLM would retain a reversionary interest in the land should Ketchum fail to use it for the purposes outlined in the patent application. In an interview after the meeting, Smith said there is no way to know when the BLM might award the patent. She said it may still be many years away. “At this point, the best-case scenario is to begin construction during the fall of 2014,” she said. Smith said the purpose of updating the P&Z on the progress of the project was to keep the commissioners “up to speed” on the slow pace of the federal government. At the meeting, Smith said once the patent is awarded, she’s not too worried about raising enough funds to build the park. She said there is significant private interest for the park and expects a large portion of the needed money to come from private donations. Smith said the city would be limited to using the land as outlined in the patent application. In response to a question by Fabiano about why the city hadn’t included plans for soccer fields and other recreation options in the application, Smith said Hulen Meadows residents have expressed concerns to her that that would lead to too much traffic in the area. “They see the BLM land as part of their front yard,” she said. Smith said the current plan achieves a “world-class” whitewater park while minimizing the impact of the park to Hulen Meadows residents.